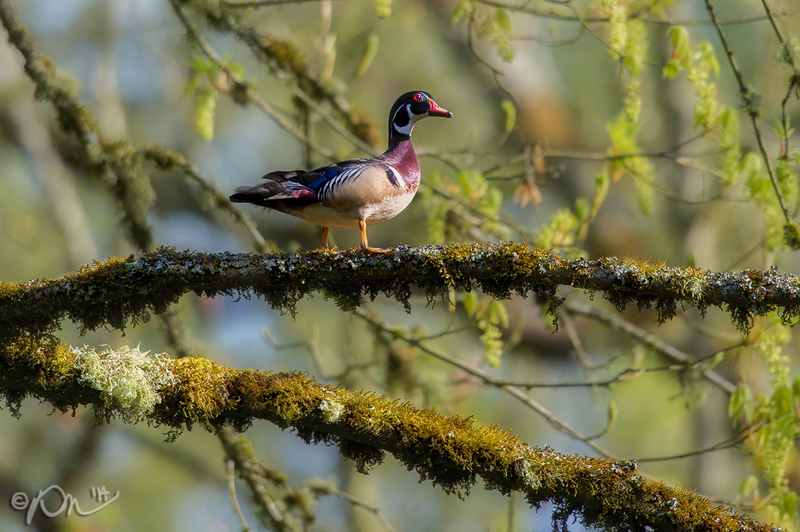 A male Wood Duck at Nisqually National Wildlife Refuge. NISQUALLY, Wash. — During winter, I usually am toting my long lens and often run into hunters. “Big lens,” many will comment. “Big gun,” I usually reply. Though a lot of birders and wildlife photographers bristle, I enjoy my encounters with hunters. After all, we’re both looking for the same thing, and we’re both going to shoot it, albeit me with a camera. We also both usually have gathered intelligence the other can use. Note: Clicking on an image will launch a full-sized version in a separate browser window). Just as no self-respecting hunter would simply be wandering around with a pistol, no wildlife photographer deploys without being well-equipped and well-informed. And ready to exercise a lot of patience. First off, trade those pistol-sized lenses you used shooting landscapes for the big bazooka lenses. No matter how much reach you may have, it’ll never feel like enough. That’s why I often use a teleconverter to give my 500mm lens a reach of 700mm. Some people also use zoom lenses, but I prefer a fixed in this instance, trading the increased necessity of moving (to change compositions) for some increased sharpness. Photographing wildlife also requires a different kind of camera, if available. In my case, I used to shoot sports, meaning I was tracking moving subjects. This required a camera that focuses more quickly and shoots faster, longer bursts. That is the camera I use for wildlife. Secondly, acquire a sense of what you want to photograph and therefore where you need to be and when. In this case, I wanted a different take on the Wood Duck, among the most beautiful of waterfowls. At Nisqually National Wildlife Refuge (Wash.), I know them to congregate in the forested land by the Nisqually River. Further, it was the end of winter, meaning there was a decent chance they’d still be looking for nesting sites. True to their name, Wood Ducks typically nest in trees, but search for images of them and you’ll find thousands upon thousands set in the water. I’ve stayed with a shoot as long as four or more hours, first observing behavior and identifying patterns, then waiting for those patterns to unfold. This time, everything unfolded more quickly, and ducking into the forest was a good remedy for the mid-day sun. I’m used to being buzzed by large waterfowl in the forests at Nisqually, but usually Canada Geese, which often nest in trees. On this day, a pair of Wood Ducks conducted the fly-by. They immediately landed on a big branch in front of me. Then the more colorful male was the one who pranced out amid a setting of lichen and moss covered branches, giving the image a distinctly Pacific Northwest feel. Yes, I got a bit lucky. But it was preparation – knowing where to be and when, and being properly equipped – that allowed me to cash in. Equipment: Nikon D3s, Nikkor 500mm f4 lens, Nikon TC-14e ii teleconverter, Really Right Stuff TVC-33 tripod, Wimberley WH-200 Gimbal head. Settings: 700mm, f6.3, 1/1000 seconds at ISO 1600.